Singapore: Targets and trust. These are at the heart of a tougher new global climate pact possibly just weeks away. The bigger the pledged emission cuts or reductions in growth in carbon dioxide pollution, the greater the need to prove nations meet those targets and curb the pace of climate change. And proof of emission reductions over time will help unlock billions of dollars in climate funds for poor nations. The problem, though, is that it is not yet possible to independently monitor a country’s greenhouse gas emissions, such as carbon dioxide from burning fossil fuels or deforestation. “Our system is not good enough right now to be able finger one country versus another. I think the density of observations needs to be cranked up two orders of magnitude," said Pieter Tans of the National Oceanic and Atmospheric Administration (Noaa) in Boulder, Colorado. Rich nations weren’t going to hand over possibly hundreds of billions of dollars to poorer nations to help green their economies purely on trust. Which is why measurement, reporting and auditing of nations’ greenhouse gas emissions is a key focus of marathon UN climate talks. The world body hopes the negotiations will lead to agreement on a tougher climate pact from 2013 during a meeting in Copenhagen next month. Rich nations are under pressure from the developing world to sign up to emissions cuts of 25-40% below 1990 levels by 2020 and funnel billions in aid and green technology to the poor. Big developing nations are also under pressure to curb the pace of their emission growth. 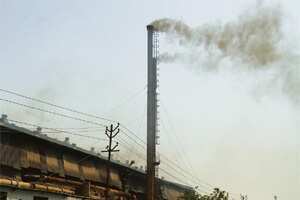 China, India, Indonesia and Brazil are among the world’s top carbon polluters. “If there’s no objective system to check lines of success, people are going to claim more than they can deliver. It’s natural," said Tans, of Noaa’s Earth Systems Research Laboratory. Rich nations such as Australia and the US have developed reliable reporting methods on energy use and fossil fuel emissions, said Pep Canadell of the Global Carbon Project. Accuracy for developing countries was often not as good. “You have huge variability. And of course the issue is, let’s check on some of the developing countries. That’s where it gets the most difficult because the reporting is not that accurate," he said, adding that until recently, China’s emissions from burning coal, oil and gas were under-reported by 20%. Noaa runs a global network that tests air samples for a variety of greenhouse gases to build a picture of how their concentrations change over time. Carbon dioxide levels are approaching 390 parts per million (ppm) compared with around 280 ppm at the start of the Industrial Revolution. If carbon dioxide rises to 450 ppm, the UN climate panel says, the planet is likely to warm by at least 2 degrees Celsius. Dozens of countries also send greenhouse gas measurement data to the World Meteorological Agency’s World Data Centre for Greenhouse Gases. Such measurements can give annual and seasonal pictures of carbon emissions. But scientists say we are at least a decade or two away from a monitoring system that can accurately reveal national and regional emissions from fossil fuels or from deforestation and other land use changes. A global network will also need to take into account the huge amount of carbon dioxide produced and absorbed naturally via so-called sources and sinks. Trees and oceans soak up carbon dioxide, while burning or rotting vegetation can release it. Winds distribute the gas around the globe, and how this occurs is still not fully understood and is only poorly simulated in complex computer models. “It’s seemed to me for a long time that there’s been a huge disconnect between the types of emission trading and associated verification that might be necessary, that’s being considered, and what we can actually measure," said Britton Stephens of the National Center for Atmospheric Research in Boulder. “People have wondered where the carbon dioxide that we’re emitting is going and we’ve been able to tell that in rough numbers that half is staying in the atmosphere. Of the half that is leaving the atmosphere, half of that is going to the terrestrial land plants and the other half is ending up in the oceans," he said. And that is where the real puzzle begins. Because carbon dioxide is shifted around by the atmosphere, scientists need powerful computers to simulate the movement of air around the globe and to crunch all the data from an army of carbon dioxide monitoring sites on the ground, in the air, and in space. More accurate measurement and models which, for example, could show how much carbon dioxide is absorbed by forests and oceans, could give investors more confidence when putting money into large carbon offset schemes. Computer models, though, were years away from proving accurate. “As everyone knows from complaining about weather forecasts, the atmospheric models are far from perfect," Stephens said. Current carbon measurement techniques are complex and time-consuming, although a new generation of measuring equipment using lasers promises much faster and more accurate results and could form the backbone of a greatly enhanced global system. Scientists also need to disentangle natural carbon dioxide from fossil fuel emissions. Fossil fuels, being buried underground for millions of years, are free of very rare carbon-14 isotopes, so it is relatively easy to track emissions from burning oil and coal in the atmosphere by analysing air samples. New instruments are also set to make this even easier. Better and more accurate satellite-based measurements are another key part of the puzzle. At present, only Japan’s greenhouse gases observing satellite (Gosat) measures carbon dioxide from space, giving data on the gas’ concentrations in a narrow column of air. But the readings can’t accurately reveal the carbon dioxide concentration at the surface where the gas is produced and partially absorbed, nor how the winds are shifting it around. “I think satellites have a chance of being extremely useful only if we have quite an extensive system of both ground-based and in-situ measurements through the atmosphere," said Tans of Noaa. Remote sensing of forests via satellites was also crucial, said Canadell. Calculating exactly how much carbon dioxide and other greenhouse gases, such as methane, are released when forests burn or are cleared is critical but this, too, remains an imprecise science. For example, a study published this month in Nature Geoscience says deforestation is responsible for 12% of mankind’s total greenhouse gas emissions, instead of previous UN estimates of around 17%. But the authors note the figure will vary from year to year. “We don’t have a system yet which we’re reporting annually exactly what’s happening with deforestation and degradation. Second, we have little information on these forests of how much carbon there is. What’s the biomass of these forests?" Canadell said a future monitoring system would need to marry supercomputers and many different monitoring tools. “What we are going to see is a multiplicity of approaches." Trust was a key driver for investment in the network. “It’s not just giving money away making sure people are doing the right thing," he said, referring to steps to cut emissions. “It’s just we’re committing a lot domestically and I want make sure the rest of the folks are doing the same. Otherwise, I’m putting myself at a disadvantage."